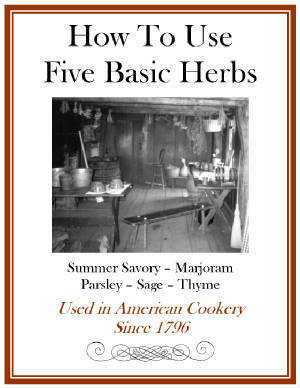 How To Use Five Basic Herbs since 1796. Herbs are plants that connect us to the past, present, and future. In 1796 one of the first books of American Cookery was published in Albany, New York. This cookbook referred to 5 basic herbs: Summer Savory, Marjoram, Parsley, Sage, and Thyme. It stands to reason that when the Pioneer’s hitched up their wagons to migrate west across Zane’s Trace, the Wilderness Trail, or the National Road, now known as Interstate 80, they packed up these five basic herbs to take along with them. With How To Use Five Basic Herbs you can learn how to grow, how to harvest, hot to dry and how to cook with the same five basic herb’s that your ancestors did! Let’s use them for the aroma, cooking, and more! Let’s enjoy a taste of history, and here’s how to from the beginning! Click here to order this eBook in PDF form to download on your laptop or computer! A great guide for the herb gardener!